After being long overdue for a break, we were scheduled to go on the longest vacation I had taken in years. A family member was having a milestone birthday, and my husband and I were to visit her. We were gone for almost two weeks. If you missed it, learn why you need a vacation here. We were scheduled to depart on the day the infamous snowstorm hit our town in April of 2018. Although we checked our flight status, we were convinced that we were flying out in that crazy storm. Once we arrived at the airport, however, we learned it was shut down. After a date at the airport, my husband and I went home because our flight was delayed 24 hours. Even though our vacation was shortened by a day, it was a blessing to fly after a blizzard and not in the midst of it. Here are some valuable lessons I learned as I look back. 1. I learned how dispensable I am. No, it does not mean that I’m unimportant. However, no family member or client suffered terribly while I took a much-needed vacation. Furthermore, I was part of a business networking group at that time and needed to find two subsitutes for my roles each week that I was gone. That group did fine without me for two weeks as well! Often we are flattered or given the impression that no one else can do what we do or do it as well. Please do not allow thoughts like that to hinder your going on vacation. 2. Rest is very important. Yes, we were dealing with jet lag, yet it was a huge blessing to have a later wake up time. In addition, there were days we went nowhere and just relaxed. It was important for my sanity to be away. 3. Two weeks is an excellent time for a vacation for me. 4. A vacation is healthy for a growing business. Earlier I mentioned that no clients suffered immeasurably while I was gone. Even better, they all seemed to need something after I returned. The month after we returned was one of the best months I had in business that year. If you are fearing the amount of work you will have when you return from vacation or how much you will be behind, please do not. A vacation is vital to clear your head and re-focus on many aspects of your life. 5. I learned about doing work in batches. Since I was to be gone for much longer than usual, some of my work had to be ready to go without my direct involvement. The other work that I did in batches was preparing my vitamins and my husband’s in daily portions. When I returned from vacation, I continued preparing several days’ worth of vitamins for him at a time in order to streamline my days. 6. No matter how much I enjoy what I do, a break is very healthy. While I love seeing the changes in my clients’ health and love the life with which God has blessed me, it is refreshing to take a break to rejuvenate. 7. Life is short. Take time to spend with family. One way to spend quality time with family is to get away from the every day duties and distractions to focus on each other. During our vacation, my husband was able to spend some valuable time with his family, and he and I were able to spend much time together. We visited museums, took walks, read, and rested together. Oh, yes, and we had to shop for souvenirs. 8. I learned how blessed I am. Visiting a different country is eye-opening. Where we visited, many people do not have cars and rely on public transportation. When I returned, I had such a luxurious feeling to know I could get into my car and drive where I needed to without regard to public transportation schedueles. Most people where we visited did not have drying machines in their homes or apartments. It is a luxury that only the very rich owned. We stayed in a very clean, beautiful apartment where the bedroom and living room were one room, and the couches turn into a bed. There was the hallway and kitchen, and that was it. I learned what a spacious home my husband and I have. Before you go on vacation, be sure to take a look at this blog post to make sure you have all the essentials for your carry on bag. 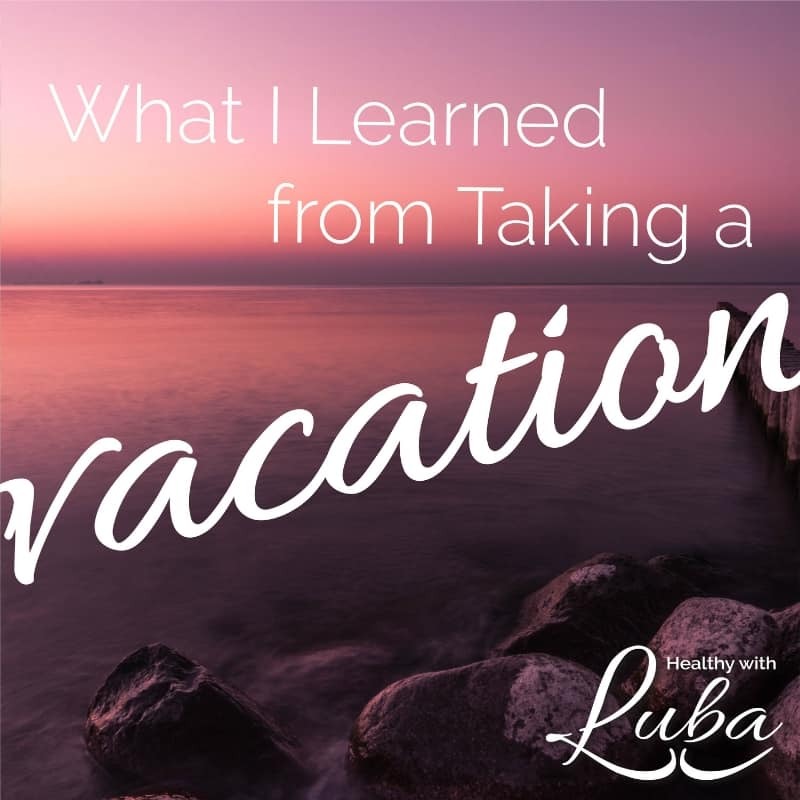 What have you learned from taking a vacation? Please share in the comments below. If you found value in this blog post, please use the buttons below to share it with your network. If you are planning to take a vacation in the next few months, let’s talk. It’s important to feel your best while you are on vacation and not be exhausted to the point that you cannot enjoy the change of scenery and quality time with your loved ones. Email me here now, and I will reply within 24 hours to schedule a time to talk so that I can learn what your concerns are regarding your upcoming vaction and your health overall. This call with me is complimentary. We just booked a 10 day vacation and South Carolina and I’m so crazy excited.